If you’re using social media properly your audience is your community, social media is about communication, and community building. Community Building is developing your audience. The moment you have a community, you have participants, not observers. People. Not Bums on Seats. In the modern world of millions of people vying for your attention, it’s not your presentation; it’s your connection to your community that’s important. This is where social media comes in. Social media offers invaluable tools in accessing the hearts as well as the minds of your participants. To people bombarded every day with ‘brand’, it’s the human touch of organisations that gets your interest and loyalty. Put more simply, social media tools aren’t about you; they’re about the people you want to speak with. Complete the picture: By providing people with access to the personal and day-to-day side of your organisation, think of it as a backstage tour of your organisation. Break down the barriers: Help to break down the perceived inaccessibility of the arts. Showing the process as well as the finished piece, means that your communities can get/feel involved in the whole artistic process. Social media allows an immediate and personal view into your company and it’s projects. Collaborate: Social media can help you make connections to people and groups you might never have otherwise encountered, it can garner immediate responses to questions, act as an instant audience-survey, it helps you see into other people’s worlds in the same way they can access yours. It connects you to people all across the country.. all across the world. It can help get your art ‘out there’: Social media is an active pastime, the people who get the most out of it listen as much as they speak – they participate. The personal nature of social media means that these people are more likely to actively support you and your work. There’s just us. All of us. Learning as we go. These tools are all so new, and there’s always something else on the horizon, because of this the only way to learn how to use them is to use them yourself, become your own expert, and connect to people who know what’s coming next. Know that everyone makes mistakes, just as everyone sometimes stumbles over their words. If you are not making mistakes you are not pushing hard enough. This is just communication, through a different medium. It’s just talking. As you’d talk, laugh, and converse in real life, you do so online. Don’t try and view it as a different language, engage with it using your own. Be yourself. Of course all of them will cross pollinate. Front facing: Your website and your blog. Posterous, WordPress, Blogger. Your front-facing media is the main landing page when someone searches for you – this is where you will collate the best of your social media activities, and where you will publish the more traditional marketing, event and company information. It is essential that you keep this space active, and interactive, that’s where a blog comes in. WordPress and Blogger are popular and easy to edit blog hosts, allowing you to add widgets, post updates, allow people to subscribe to your RSS Feed and more. Posterous is a super-simple blogging platform which allows you to post almost anything via email, meaning that they deal with all the media and other content that you want to attach. Currently, almost all mainstream social media is geared to link up with twitter – the simple, short and easy way of sharing your real-time exploits online. Twitter is your main tool with regards to immediacy, and behind the scenes access to your community. For an in depth guide to why you should be using twitter, along with a guide to the jargon, programs and different tones you can cultivate, have a look at Hannah Nicklin’s guide to Twitter for Arts Organisations, on the Get AmbITion website. What can be a little more challenging as an organisation new to Twitter is cultivating your presence and community, before you have people to talk to you will be tweeting into what feels like the dark, and you need to make sure you don’t fall into the bad habit of only pushing front facing style communication. Keep talking to people, asking questions, and sharing other people’s information as much as possible. Facebook statuses can be used in a similar way to twitter, although try not to replicate information, you want people to feel as though they’re discovering more about you as they explore your digital footprint, not digging up all of the same information. 12 Seconds will also auto-tweet, and in ways is a video version of Twitter, allowing you to send 12 second videos out to the world. This is great for snap shots into a working day or general process. You can post by email, online, or mobile applications. Flickr and Youtube allow you to share images and videos; it lets you ‘tag’ media, meaning that it will be easily found in google searches, and offers the ability to embed elsewhere online. Audioboo is an instant podcasting solution currently available to iPhones, iPod Touches and android devices. It will soon be browser based too. Posting to Audioboo you are able to add a location tag, picture, and immediately host a piece of audio. The audio will be auto-tweeted, and can be downloaded/subscribed to via iTunes from the Audioboo site. Audioboo is a brilliant way to keep people updates when you are short on time, and a less intrusive tool for interviewing people. Eventbrite allows you to create ‘events’ and share them online – you can charge for tickets (thought you don’t have to), provide links, information and maps, as well as enabling people to instantly download the information to their chosen calendar (outlook or ical usually) This is a great way of disseminating event information far and wide. Also check out the more succinct Tweetvite which works in much the same way for smaller non-ticketed events. There is much more on the market which will help you interact with your online community, but these are the basic physical tools which will enable you to do all of the above. A Canon Ixus 120 IS– roughly £180 this will do great HD video, and high quality images. The camera is compact, robust and easy to use. 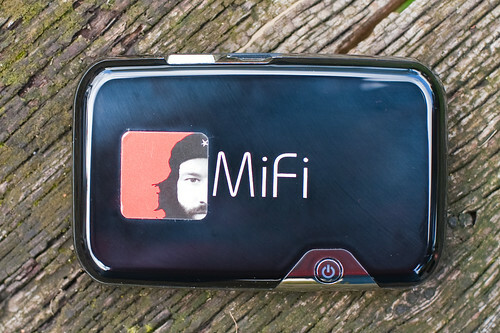 A MiFi free on some contracts a personal wireless hotspot, utilising 3G networks, this allows you to turn the iPod Touch into an almost replicate of the iPhone, meaning you will be able to tweet, Audioboo, browse and email blog entries almost anywhere. Most of these tools link to and auto-update a twitter account, if they don’t, always, always tweet about it. That is the feed that people are most likely to stumble upon and should be the backbone for your media. TWITTER: 3 x 15 mins interaction, a few tweets a week – general observations an RTs to start, replying to any @ replies, listening and building up. 12 SECONDS – Download the app to your iPhone for free – record any video and it will take the first 12 seconds and tweet it to your chosen twitter account. Quick snapshots of scenery, theatres, comment, sets, offices, weather, anything. AUDIOBOO – try audioboo reviews of shows you see. Very simple program. TWITTER:cultivate personal account, and tweet at least once a day from the 7 categories, try one before lunch break, and then reply to any responses when you’re back, simple and allows for conversation. FACEBOOK: when you put out an opportunities, also put the link on the Facebook page, and link people to it via twitter. FLICKR: use for high quality, front-facing images. WORDPRESS: More formal blog RE the artistic outlook of the event. POSTEROUS – Use for more immediate things in lead up, collections of photos, video, audio trails, push it to the WordPress. YOUTUBE: Cut together a really simple video, just audio and photo stills if necc, post to Facebook, Posterous, Blog, Youtube. People are much more likely to watch something than read about it. EVENTBRITE – Create an online event that you can link across all social media, tweet it. FACEBOOK – Make an event, offer discounts, add videos and pictures. AUDIOBOO: Interview vox pops with participants and performers, record your own reactions, or take short clips of dialogue/monologue or sound/music. TWITPIC/VID: Tweet pictures and videos of the event. FLICKR: Take as many photos as possible, the more you take the better the chance of some good ones. Be ruthless in the edit. Post the best. TWITVID/YOUTUBE: Use a digital camera to take slightly longer interviews and post in the evening/day after. Keep it simple to avoid the need to edit. Be polite – say hello to new participants, or people you’re interested in, thank people for links and recommendations. Listen – Social media is all about being sociable. Listen to people, interact with them. Inform – link to useful and interesting information, be it software, articles or news items you come across. Credit, link and promote others – Never appropriate, always acknowledge people, it will make them more likely to disseminate your content too. Share the link-love. Don’t spam – By all means promote your art, but don’t spam – make it genuine, exciting and relevant and try not to repeat yourself. Be funny – Don’t try too hard but sometimes the best way to catch someone’s fleeting interest is to make them smile. Be human – Not always obvious but very important, being a “real” person, rather than a representative is important. Balance it. People talk to people..
Have fun! It really is a wonderful world to be a part of, get involved. Blog – originally known as a Web Log – it’s an online and public space for writing, thoughts and reflection, normally allowing comments from others. Post / update – an entry on a blog, social media platform or website. 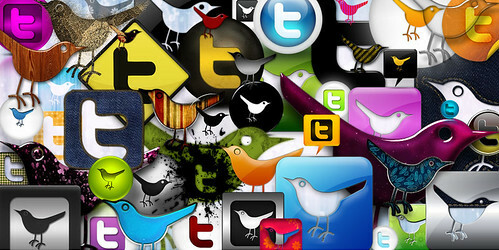 Micro-Blog/ging – micro-blogging describes the phenomenon ofsites such as Twitter – blogging done on a micro, mobile scale. Originally based on the 160 characters allotted to a text message. Twitter – a quick and easy way of sending ‘status updates’ – small pieces of text up to 140 characters long – about what you are thinking, doing, or a link to news and information. HashTags (# + keyword ie #getambition) – are a community-driven method for adding metadata to tweets. When used, every hashtag (the hash symbol attached to the front of a keyword) becomes a click-able link enabling the user to create a real-time search of that keyword effectively creating groupings without changing the basic twitter service. Re-Tweet/ed (RT) – when someone re-posts one of your tweets (linking to you in doing so) because they have appreciated what you’ve said enough to want to show their followers in their network. Auto-Tweet – when an application or program automatically sends a tweet to your twitter account when you update said application or program. For example whenever you post to Posterous, you can set it to send a tweet with the title, and a link to the blog post. Feed / Stream – colloquially (online) these both refer to a series of entries in an online space – i.e. a person’s twitter stream consists of their status updates, and a Flickr stream would consist of a person’s uploaded pictures. Widget – a small add on to a web page or blog, most social media platforms provide you with widgets, showing your most recent updates. Embed – to take a piece of media hosted elsewhere (youtube, flickr etc) and to share it on another web page or blog. Quite often a ‘share’ button will offer you embed code – this should be cut & pasted into the html edit section of a blog or website, or can be emailed directly in to Posterous. Podcast/ing – Subscribe-able audio broadcasts online. Great post. I especially like the Case Study for ADs and GMs; a nice step by step handhold which is also practical, eminently doable, and should yield results almost immediately. found this to be immensely helpful as I’m trying to help my dad with all this stuff but haven’t figured out how to share the task. sorry if I missed something obvious in there, but what are the 7 Categories you mention in the Everyday / General Manager / Twitter section? Absolutely wonderful post. I feel like I should have paid a fee to be so well informed. Found your blog via your website via documenatally/vimeo via the American film critic Riger Ebert’s tweet on twitter. How’s that for a social media history… I’m a musician (singer bandleader) living in Chicago, IL. I will be back! Hi Lynne, thanks for the kind comment. What’s your’s and Riger Ebert’s twitter names. Hola Documentally ~ I got a Link to this website via Twitter. I do appreciate your overview of Social Media. I am a Moderator for several Yahoo Groups but see the limitation of ‘preaching to the choir’ within the limitation of a Yahoo Group. Now I work with some Groups via http://www.ning.com/. Plus, I have a some blogs, a few of which I use as kind of storage chambers on different subjects. For me a lot of my life in these troubled times revolves around the concept of ‘concentration on the coordination of communication’. Plus, I strive to be a humane rights activist online on different platforms, offline out in my local community and inline with my own creating writing, prayer and meditation. Balance in diversity is key for me. Keep up the good work and continue to do the best that you can. Great post Documentally! Comprehensive and pragmatic. I’ll be recommending this to the indie artists I work with, who are just beginning with the social web. Nice job. This is a great post! Just to let you know that the website for this years Shift Happens conference is http://www.shift-happens.co.uk (As I spotted that you quoted @untheatre and @wethink from last years event).